As an infant, he was saved by Ki Shou and became his 100th child. He only had one senin bone, however, he became the disciple of the eccentric Konronsan senin, Unchuushi. Under his modifications, Raishinshi's skin became black, and he grew the wind and lighting controlling, wing-shaped paopei, Tensouyoku, from his back. 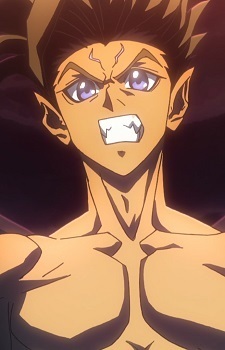 With that power, he successfully escaped from Unchuushi's tyrannical experiments, and thought to return to his father, but concerned with his current form, he instead gained fame as thief for the people, during which he fought and lost to Taikoubou. At this chance, he disbanded his group of thieves, and after training in Konronsan, he participated in the Shuu revolution. Because he was busy having his wings remodeled (increasing power and upgrading to three pairs), he has proportionately less screen time than other characters. However, toward the final battle, his number of appearances increase. In the manga version, by the time of his father's, Ki Shou's, death, they had not met, but in the anime they are reunited. Raishinshi is a comedy relief type character with a hot temper.